National home prices appreciated 5.7 percent. Oregon home prices saw the highest increase at 11.7 percent year-over-year. Florida ranked second at 11.2 percent. The Federal Housing Finance Agency (FHFA) announced that national home prices have once again increased. The increase, a slight 1.3 percent since the last quarter, brought year-over-year growth to 5.7 percent. 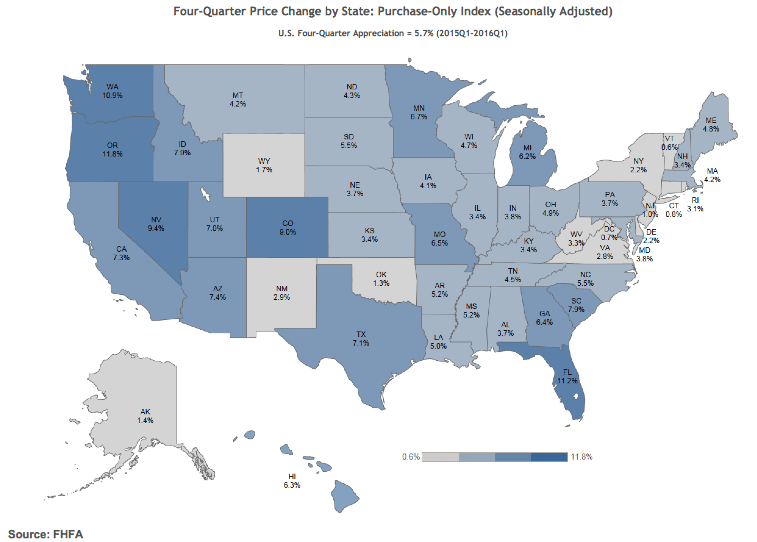 Oregon, Florida, Washington, Nevada and Colorado had the highest annual increases. “Income growth is relatively robust in the states with the fastest appreciation. Other than that — and the fact that most are in the West — conditions in each state tend to vary,” Leventis said. Out of the 100 most populated metro areas in the United States, the West Palm Beach-Boca Raton-Delray Beach market in Florida increased the most annually at 16.7 percent. Baltimore’s growth of 3.15 percent over the past year is great in terms of trajectory, but it failed to meet the growth level of the previous quarter. Home prices in D.C. and the surrounding metros of Alexandria and Arlington increased 4.24 percent year-over-year. Washington D.C. has experienced the most growth in home appreciation since FHFA began collecting data. According to Quicken Loans’ Home Price Perception Index, Chicago residents overvalue their homes by nearly 3 percent. Home prices in Chicago are increasing, if only slightly more than the optimism of its residents. Homes prices in Chicago, Naperville and Arlington Heights (the coverage area) increased 3.96 year-over-year. Although home prices in Houston have increased 4.18 percent since last year, the recent slow down in home sales is causing some worry. Home prices are actually slightly down since the last quarter, but a 16.7 percent boost in new listings could begin to turn that around. The steady rise of Los Angeles home price appreciation, and California overall, could be a significant factor in the current inventory issues California is facing. With that said, L.A. homes saw an increase of 8.43 percent since April 2015 and a 2.06 percent rise since the previous quarter. Opposite of California’s major market views, Miami residents tend to overvalue their homes, according to Quicken Loans. Since last April, though, home values have steadily increased 9.6 percent, and the Miami metropolitan area has watched its home prices appreciate 236.49 percent since 1991. The New York City metropolitan area includes Jersey City and White Plains. Homes in these markets only appreciated 1.09 percent over the year, and even dropped 0.25 percent since the last quarter. The Bay Area is always hot. According to a recent RentCafe post, rent prices in San Francisco are projected to jump 10.5 percent. On that note, home prices appreciated nearly 7.5 percent since last year. The growth, however, was less than the previous quarter by 4.59 percent.